Larson concludes that Surratt was guilty. She is convincing in arguing that Surratt, who had worked to earn Booth’s confidence, was one of the few people he fully informed of his plan. (As we know from The Lincoln Assassination there was, in fact, even more evidence of her guilt than was presented at trial.) Larson is particularly good when handling Surratt’s arrogant behavior toward the police during the interrogation and the trial. 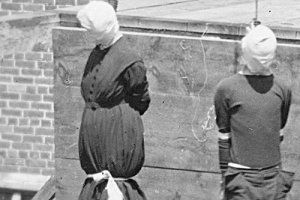 Surratt believed that she could stonewall; perhaps her motive was to protect her son, and certainly she assumed that as a woman she was safe. Her ultimate collapse just before her execution was affecting if only because it confirms what an act of courage and nerve it had been to steel herself up until that point.